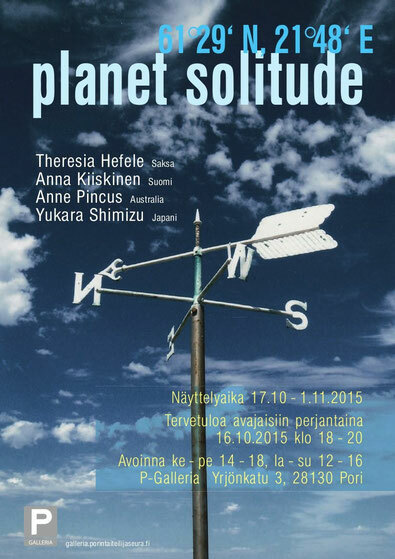 In 2015 I developed, together with the Munich-based artists Theresia Hefele, Anne Pincus (Australia) and Yukara Shimizu (Japan), the exhibition concept and international art project „planet solitude“ around the subject landscape. We also invited the following four artists from Finland to take part in our project: Mollu Heino, Marko Lampisuo, Talvikki Lehtinen und Päivi Setälä. Together we offer eight different views of the subject landscape and the nature in general, eight various perceptions of our daily environment in the city or in the countryside, of the forests, fields, water landscapes or city gardens near to us. As artistic techniques we use photography, painting, sculpture, installation, printmaking and video art. „For all eight artists the essence of their work lays in the still, contemplative moments that allow an intensive perception of the given surroundings. In these moments of peace and solitude – whether in the countryside or in the city, in the daytime or at night, but always taking a conscious distance from the daily haste and hurry – their perception is totally focused on the subject they are observing. The deliberate search for seclusion as a work principle can be seen both as a way of refuge and of self-reflection.